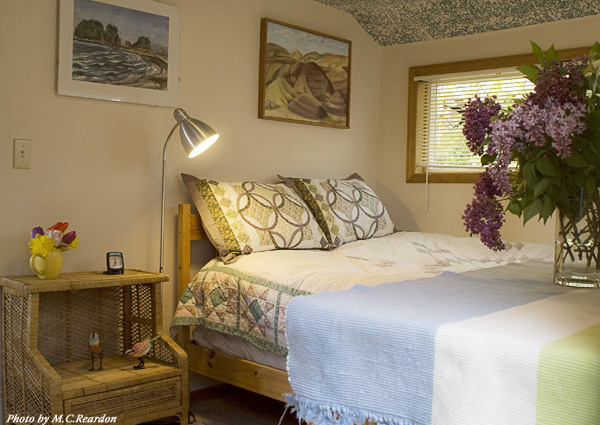 Surrounded by a lush serene garden, this beautiful little cottage is a peaceful sanctuary and the ideal place for 1 -4 guest.  It’s the perfect retreat for someone needing time for him or herself, or a couple looking for a romantic getaway. 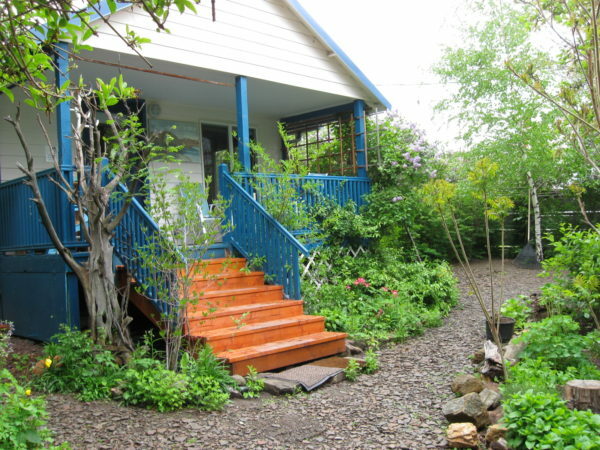 Even a small family of 4 will enjoy this cozy charming cottage . 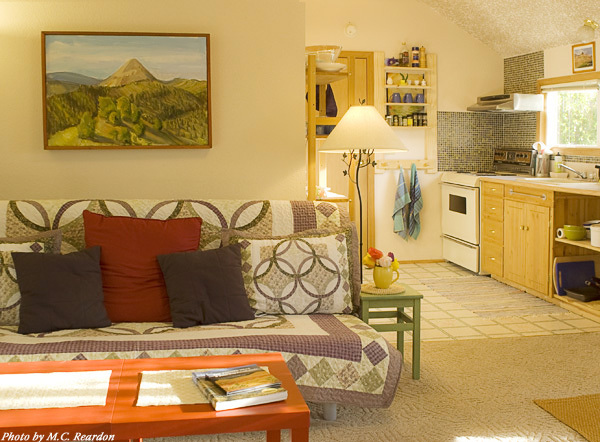 It’s equipped with everything needed for a special vacation and restful stay. 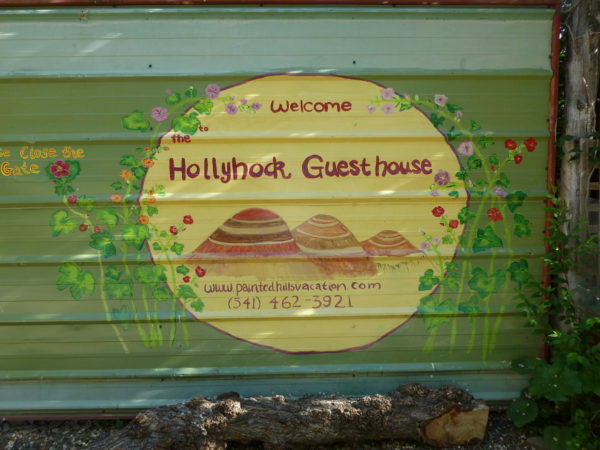 Here at the Hollyhock Guest House you will sleep peacefully to wake up rested and energized, ready for an Oregon adventure. 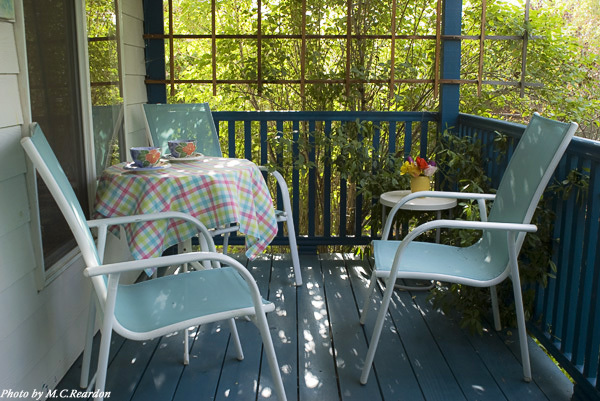 The Hollyhock Guest House is a cozy one bedroom cottage decorated with tasteful European style furniture, and is surrounded by a beautiful private garden. From the bright blue porch you step right into the living room featuring a large screen TV, special sound system with a DVD player along with a collection of movies to suit every taste. The walls are decorated with paintings of a unique local artist, and reflect the rugged beauty of this area. The comfortable sofa is a queen size hide-a-bed. Cozy down blankets and linens are provided. The bedroom has a queen size bed with a high quality mattress, and down blankets with colorful linens. From here, you can step out into your own private garden for your morning coffee, or to relax under the trees in the lawn chairs. 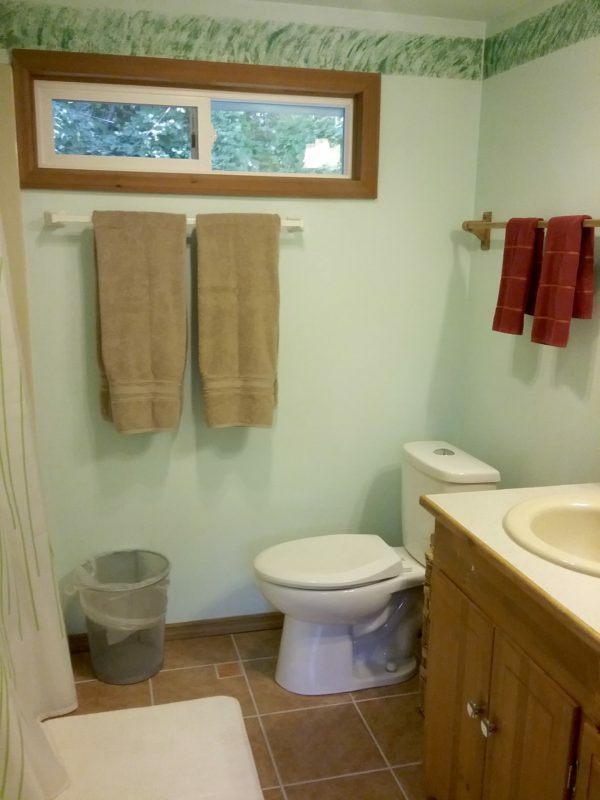 The bathroom has been remodeled and features custom-built wood cabinets, vanity mirrors and a combination tub/shower unit. It is well stocked with large fluffy towels, and French lavender soap. The kitchen has all the equipment necessary to make cooking a fun and easy experience. It is stocked with the basic condiments, an assortment of herbs and spices as well as gourmet cookware, blender, microwave, and a Senseo coffee machine (bring your own espresso pads or buy them from us). In the warm seasons you can dine on the porch surrounded by flowering trees and shrubs, while on colder days you can enjoy your meals in the cozy inside dining area. The extra remodeled barn-room is available for hanging out to play games, read, or watch a movie, and can sleep two more people in a cinch. ~PETS? All pets must be declared prior to arrival, and a $25/pet/night fee is required; this fee must be paid in person before the end of your stay. Throughout the beautiful garden there are many nooks and corners with benches, lawn chairs, sun-umbrella, and an outdoor dining area with a barbecue. Lighting fluid is provided. Bring your own charcoal! You can pick your own culinary herbs in the little herbal garden. The water from the tap is from the town’s own mountain spring and very good for drinking. Fill up your bottles! 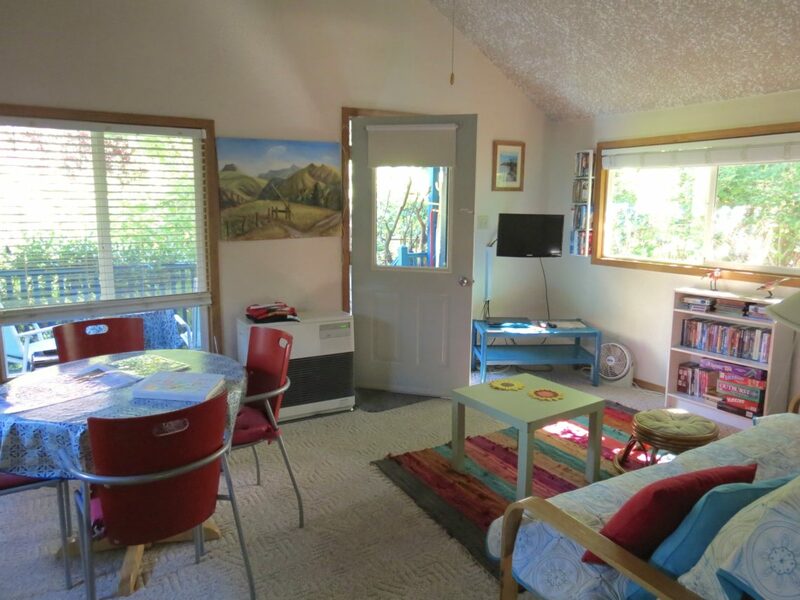 Selection of games, wood stove, supply of firewood ($12/day) seating for six, sofa, cozy reading nook with library featuring a variety of paperbacks. Can sleep 2 more in a cinch on a pull out sofa bed (ask ahead). Children love this whimsical room. Wireless Internet is available throughout the cottage, porch and garden. Shower/tub unit with rain shower head, custom build wood cabinets, vanity mirror, sink, organic soap, shampoo and conditioner, toilet paper and plenty of fluffy towels are provided. Electrical stove with oven, large refrigerator with freezer space, microwave, coffee machine, coffee-grinder, blender, rice cooker, toaster, electrical water-kettle, gourmet cookware, utensils and dishes for 4, basic condiments, herbs & spices. Bedroom features double bed, with high quality mattress, fluffy European down comforter and cozy pillows with cotton linens provided. A comfortable pull out sofa bed in living room can sleep an additional two guests. Pets are welcome but please respect our no digging rules and clean up after your pet. There is a $25/pet/night pet fee! 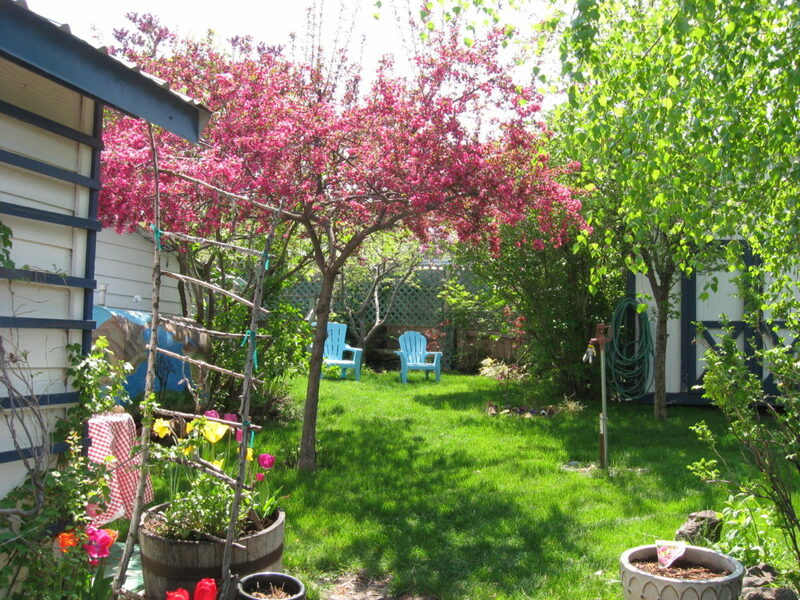 Some of the garden is fenced in so your dog can roam freely. The cottage features a big screen smart TV with DVD with a wide selection of award winning movies from around the world. Also a good variety of films, some fun games and art supplies for children of all ages. The cottage has air conditioning in the warmer months from May till October. 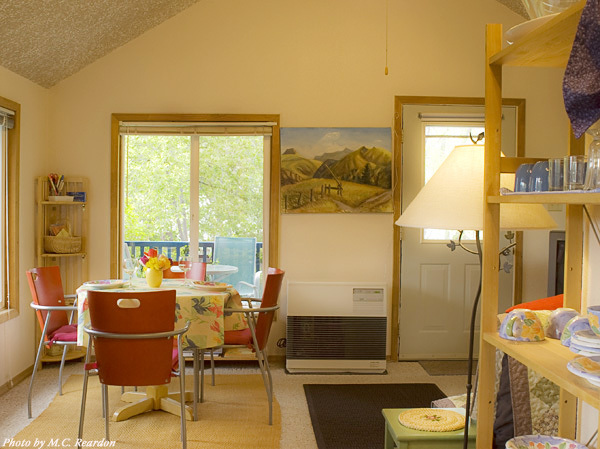 There is a Laundry room with a washer & dryer, iron board, iron, laundry soap, extra towels, cleaning supplies. Rates are based on the occupancy of up to 3 guests. Additional guests are $30/night. Holidays and special events: weekend rates apply. 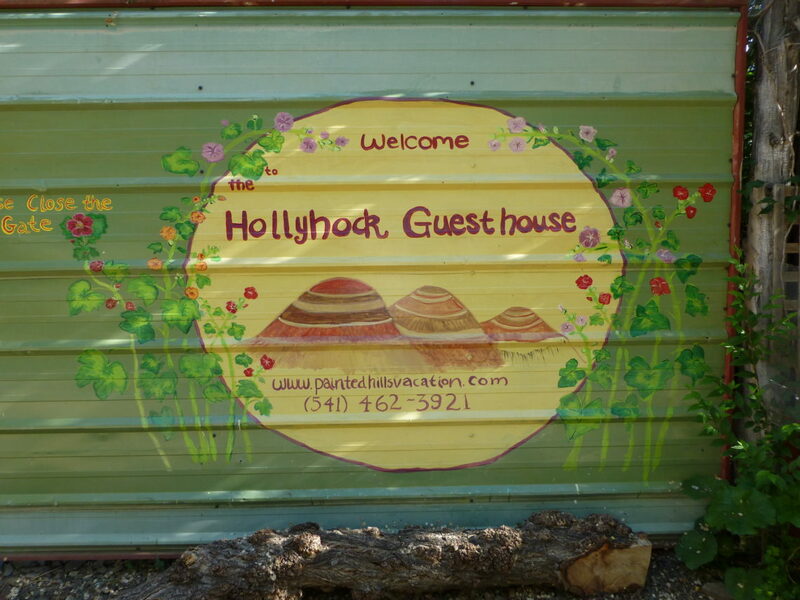 We can't say enough about how much we enjoyed our stay at the Hollyhock Guest House. We were wishing we could extend our stay. We were glad we arrived early evening to enjoy the patio with games and drinks before dark. We walked the grounds, enjoyed the garden/flowers. Our dog was delighted to run free with the closed in property. Sleeping accommodations were perfect, very comfortable and spacious. Everything you could want for comfort of a home, full kitchen, bath with all amenities. After exploring the hot and rocky landscapes, coming back to the cool gardens of the Hollyhock House is a delight! It’s a green lush oasis, with doves cooing and wind rustling the poplars like water. The house itself is delightful and cozy! The kitchen has everything you need and the whole place is very charming. Stargazing is wonderful in this area. I have returned here many times. The owners are gracious and helpful. It is dog friendly and full of charm. I can't get enough.